In case you missed it, and I certainly would have if not for someone asking a question, Apple's fiscal 2012 first quarter earnings report has a jaw dropper. 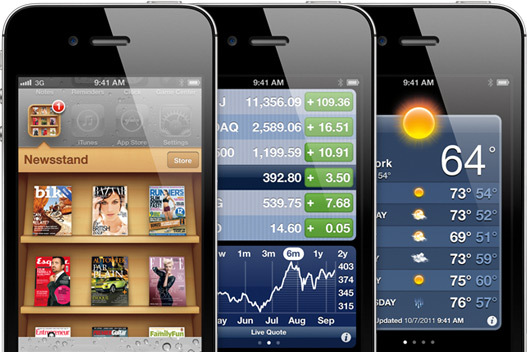 iPhone generated $24.42 billion revenue. During the same quarter, all of Microsoft: $20.89 billion. More broadly, Apple revenue ($46.33 billion) was more than twice Microsoft's, and net income nearly was ($13.06 billion versus $6.62 billion, respectively). But it's that iPhone figure that really stands out. One product's revenues against an entire company's. Microsoft's margins are better, but who wouldn't want more money in the bank? Nearly five years ago, Microsoft CEO Steve Ballmer dismissed iPhone, in a USA Today interview: "There's no chance that the iPhone is going to get any significant market share. No chance. It's a $500 subsidized item. They may make a lot of money. But if you actually take a look at the 1.3 billion phones that get sold, I'd prefer to have our software in 60 percent or 70 percent or 80 percent of them, than I would to have 2 percent or 3 percent, which is what Apple might get". How's that for the mother of wrong predictions? Thing is, now Microsoft's software is down there in the low single-digit market share doldrums, while iPhone share rises. At end of fourth quarter, for example, Windows Phone share among US subscribers was 1.4 percent, according to Nielsen. iOS: 37 percent, up 7 points in two months. That's all while making "a lot of money". Ballmer's licensing strategy failed, with Android and iOS stealing share from Windows Mobile and Phone 7. Okay, so maybe Microsoft collects $30 a license -- hey, let's be generous and call it fifty -- compared to Apple's $600 bucks per phone -- and many more units. Which amount would your business rather take in? But it's not just iPhone. Apple did something remarkable during fourth quarter -- Mac sales grew during three months when PC shipments were their worst in a decade, according to IDC. Apple sold 5.2 million Macs, generating $6.6 billion -- or more revenue than any single Microsoft division. Closest: Office at $6.28 billion. In the United States, fourth-quarter PC shipments fell for every vendor in the top five but Apple, according to Gartner. HP shipments plummeted by more than 26 percent -- meanwhile Apple's grew by 20.7 percent. IDC put HP's decline at 25.3 percent and Apple's gain at 18 percent. The Mac maker solidified its No. 3 ranking, with market share rising to 11.6 percent from 9 percent year over year according to Gartner and to 10.92 percent from 8.63 percent by IDC's reckoning. Revenues for Microsoft's Windows division fell by 6 percent to $4.74 billion, while income plummeted 11 percent to $2.85 billion. For comparison, Apple portables generated $4.66 billion revenue, up 26 percent year over year, or nearly as much. Microsoft blamed slow PC sales on the hard drive shortage caused by flooding in Thailand. During today's earnings conference call, Apple CEO Tim Cook said the hard drive shortage had no "material impact" on Mac sales and he doesn't expect any for fiscal second quarter. However, Apple does expect to pay more for drives. These numbers were unheard of even just a few years ago. During fiscal quarter 2010 -- yeah, just two years ago -- Apple reported $15.68 billion revenue and net profits of $3.38 billion. Two years later, Apple nearly tripled revenue and almost quadrupled earnings. During the same quarter two years ago, Microsoft generated more revenue and net income than Apple -- $19.95 billion and $6.64 billion, respectively. My how fortunes change.